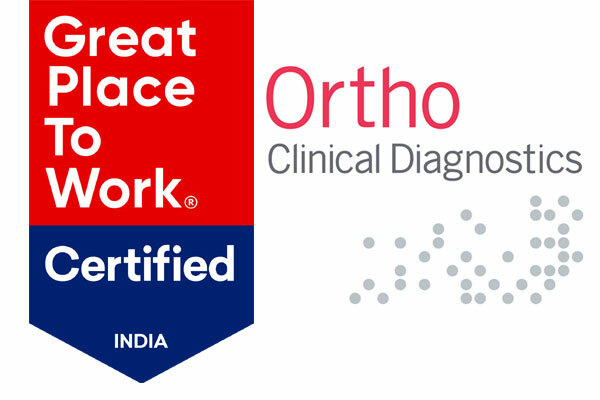 Ortho Clinical Diagnostics India has been certified as a Great Place to Work , after a rigorous assessment process. Great Place to Work Institute, India conducted an employee survey on culture and practices, interviews with employees, and essays on Ortho India policies, best practices, programs and day-to-day management behaviours. “India is a key growth market for Ortho,” said Alex Socarrás, Chief Commercial Officer, Ortho Clinical Diagnostics India. “We’re committed to delivering solutions that help hospitals, hospital networks and blood banks in India keep pace with increasing test volumes without sacrificing accuracy or precision. We do that by keeping our workforce excited, inspired and driven to support our customers – in short, by providing a ‘great place to work,” he added. Just this past year, the Associated Chambers of Commerce and Industry of India (ASSOCHAM) honoured Ortho with a services excellence award recognising the company’s reputation for premium customer service and support. “This latest recognition is yet another testament to Ortho’s positive workplace culture and our commitment to service, which we demonstrate as a trusted adviser to our customers, partners and teams every day,” said Anand Pande, Vice President, Ortho’s Asia-Pacific region.